Diorama: "Mail Call for the Sons of Thor"
"Mail Call for the Sons of Thor"
This photo of a black artillery crew somewhere in France was my inspiration for building the 155 howitzer and the setting of my diorama. (I opted to crew my gun with white soldiers for several reasons, including the lack of African American replacement heads and plans for a future Red Ball Express diorama, which will feature black truck crews.) You can see how the front perimeter was built up to provide come protection for the gun and crew; the "spoil" for the parapet came from digging a slight slope for the gun (either with shovels or bulldozers) to provide some drainage and from trenches used to store ammo and offer cover to the gun crew. Note again the silver appearance of the gun tube. 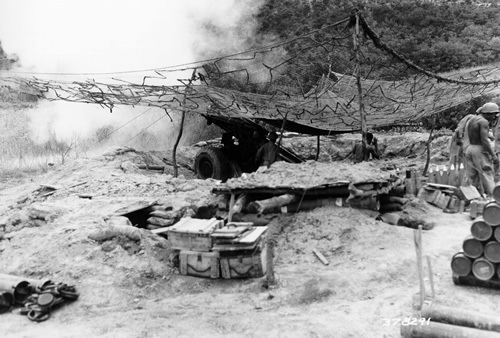 The above emplacement is a 2nd Infantry Division position during the Korean War. Note the covered trenches and ammo pits, the empty charge propellant canisters and lids on the left and the stack of canisters on the right. The crates are likely containers for fuzes. 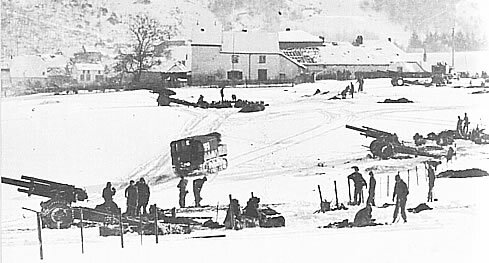 This is an interesting photo of a battery of four howitzers in the open near Wiltz during the Battle of the Bulge. They may have just arrived or were anticipating a short stay since they are not dug in. You can see an M4 or M5 tractor, perhaps just having supplied the foremost howitzer. It appears there is another in the background of the upper right corner. 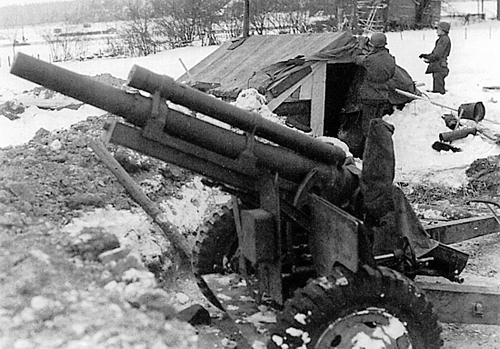 Finally, this photo of a 101st Airborne 105mm howitzer at Bastogne provided the inspiration for the hut in my diorama. Note the chimney at the rear of the crew's home. It appears the emplacement is sloped down toward the front of the gun, and there is perhaps a trench in the background behind the gun tube.